Each year the museum celebrates the birthday of Galena’s favorite citizen, Civil War hero and our 18th president, Ulysses S. Grant. Did you know that U.S. Grant lived in Galena prior to the Civil War and ran for president while living in Galena? Learn more about his life here during our annual Grant birthday celebration, which includes a state dinner on Saturday, April 13. See more details about Dinner with the Grants and the schedule for Friday, April 12 through Sunday, April 14 below, and check back at galenahistory.org for updates. Saturday evening, April 13, the Historical Society presents President Grant’s State Dinner at Eagle Ridge Resort & Spa ballroom. President and Mrs. Grant invite friends to join them for this grand occasion. The event includes a five-course meal inspired by dishes the Grants served at the White House. Semi-formal or period attire are appropriate. Tickets are available for $75 at the history museum website, www.galenahistory.org. A limited number of seats are available at the President’s Table for $95 by calling the Historical Society at 815-777-9129. RSVP by April 9. The schedule for President Grant’s 197th Birthday Celebration offers numerous opportunities to join in on fun. Unless specified, the activities are free of charge. 5 p.m.to 6 p.m. – The popular Grant Home Lamplight Tour, at the Grant Home State Historic Site, 500 Bouthillier St., gives participants the opportunity to see Grant’s home as he and his family saw it – by the soft light of gas lamps. 9 a.m.- 4:30 p.m. – Galena & U.S. Grant Museum, 211 S. Bench St., free admission and refreshments. 10 a.m.& noon – Main Street Walking Tour with General Grant; meet in DeSoto House Hotel lobby, 230 S. Main St.; $15 per person. 11 a.m. – Home Front Pie Auction at Gateway to History; dozens of locally donated pies will be up for auction. Noon – The trial of the “Nefarious Plot to Capture General U.S. Grant ,” and more events to come at the History Museum. 6 p.m. – Social Hour for President Grant’s State Dinner, Eagle Ridge Resort & Spa; 7 p.m. dinner. ; 8:30 p.m. concert and dancing. 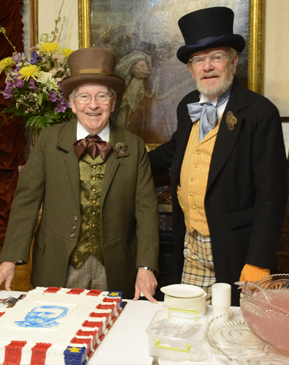 9 a.m. – 4:30 p.m. – Birthday cake and refreshments at the History Museum. 10:30 a.m. – Historic Methodist Service, with circuit-rider preacher, at the Galena Untied Methodist Church, 125 S. Bench St., where the Grant family worshipped. Potluck to follow service.